With Porsche’s blessing and license, Fanatec has created a product that can honestly be considered, the Porsche of simulation racing wheels. The detailing and craftsmanship shows their commitment to mimicking a real Porsche steering wheel. See below for a side-by-side comparison. On digital film, Fanatec’s shifter on the left looks almost identical to Porsche’s shifter on the right. About the same size, had Fanatec made theirs with the same materials Porsche uses to produce their shifters, my hands would have trouble telling them apart. I can’t wait to go (virtual) racing! The GT2 wheel is the only wheel Fanatec currently offers that is compatible with three platforms – PC, XBOX 360 and PS3 – and it is the only wheel offered that is compatible with the XBOX 360. For those with racing games on more than one console, this is a great advantage because purchasing the GT2 Wheel - US goes further compared to the other racing wheels Fanatec offers; instead of buying one wheel that only plays on PS3 or another wheel that only plays on XBOX 360, the same wheel works on both consoles. The views expressed are based solely on my observations of how the product behaved with me; I will try to prevent this from becoming a review of the racing games used to test the wheel and focus on the pros and cons of the hardware. However, I do note when certain games are more compatible with the race wheel’s features. For instance, not every racing game is compatible with every output feature the Fanatec wheel offers. Most games on X-BOX 360 are capable of sensing 120° of movement; the Fanatec GT2 racing wheel can output 900° of movement. In those games, the race wheel’s feedback to the console will not affect the car after exceeding a certain range of movement. Some older games are not compatible with the Fanatec’s six-speed manual gear shifter and the clutch pedal. To prevent my left foot and right hand from falling asleep during the review, I will not play such games with the race wheel. Assembling the wheel wasn’t too difficult. READ YOUR MANUALS! The wheel, pedals, shifters and wheel stand come with product documentation, so make sure you read it before you start playing! The helical shifter needs to be programmed for use, and had I not read the instructions, I would assume I was shipped a faulty part. With my wheel, pedals, shifter and stand installed per the included instructions, it’s time to begin. First, I drive around Road America in Forza Motorsport 3 on the X-BOX 360. While Forza 3 is a newer game, as I mentioned earlier, it cannot detect more than 120° of wheel motion, but it can use the clutch and six-speed gearbox. The wheel’s built-in LCD screen allows users to enter a “tuning” mode for the wheel, where aspects such as the force feedback sensitivity, ABS simulation motor engagement (The ClubSport pedals have a motor that vibrates to simulate ABS! Awesome feature!) and other features can be adjusted to get the right “feel” from game to game. It’s important to experiment with these tuning settings, especially if you’re unfamiliar with a particular game. I thought the folks at Turn 10 would have programmed the game to accept wheels with more than 120° of motion, but after many missed apexes and off-road excursions, I dialed in the wheel’s sensitivity to 120° and noticed an immediate improvement in the virtual car’s response. After this adjustment, there was far more driving and less sawing hopelessly at the wheel while a virtual world spun around me. In all honesty, I suspected the playability for games like Forza 3 would be greatly diminished from a lack of sensitivity (relative to the GT2 wheel’s output capability) but this was not necessarily the case. When I attended my very first High-Performance Driver’s Education class, I learned the importance of precise, controlled steering inputs. More often than not, if I found myself rotating the steering wheel more than 180° and crossing my arms to get through a corner, I was A) way off of the racing line; B) understeering like crazy; C) preparing to put the car in a terrible spin – or some combination of the three. This applies to virtual racing as well; the times I needed the game’s sensitivity to match the wheel’s output and the times I accidentally drifted/skidded/spun off the track coincided with one another consistently throughout my driving sessions. After shutting off the XBOX 360, I connected the GT2 wheel to my PS3. I start playing Gran Tursimo 5 . Let it be known now that due to licensing issues, Porsche Purists will be hard-pressed to find their favorite Porsche in this game or the upcoming Forza 4 release. At the time of this writing, a race-prepped Miata is still a little expensive for me, but I understand there are five RUF cars available for purchase as soon as I invest some healthy hours into racing through more of the game. Gran Tursimo 5 accepts wheels and peripherals of all sorts, so in the options menu I let the game know what kind of wheel I intend to use and tune the wheel back up to 900°. I load a night race at Laguna Seca with my Miata. I don’t mean to deviate from my review of the Fanatec hardware, but WOW, great visuals! The sunset reflecting off of the car and track looks fantastic as I crest the corkscrew carrying too much speed, and as I slide sideways downhill, the GT2 wheel’s powerful force feedback motors fight to tear the wheel from my grasp. Do Fanatec’s specialized race wheel, pedal assembly and shifter set change my attitude towards racing sims? Let’s just say that now I’m more focused when I play Forza and Gran Turismo. There could be a separate write-up to examine the advantages of practicing for track days with sim racing, but that’s a topic for another day. I decide to play through some Time Trials and find myself lost in concentration, lap after lap. I’m not going through the motions, either. I’m scrutinizing my entry into each corner, trying to find the ideal turn-in location. I’m looking into the background to find reference points for my braking zones. I’m not worrying about shaving seconds off my lap times, I’m focusing on improving each corner, and modifying my race line with each successive corner as I carry more speed. I’m paying attention to the position of my hands, trying to limit my steering inputs whenever possible. I’m experimenting with which gear is ideal for each corner. I’m rotating the car with trail braking and throttle modulation. I’m driving. I’m playing a game. I’m playing a game with the seriousness and concentration that I’d bring to a Driver’s Education class, and I haven’t left my living room. Four hours pass. I’m exhausted and have work in the morning, but part of me is still eager to continue playing throughout the week. There are corners to improve on and races yet to be won. There are driving behaviors I practice in real life, such as heel-toe downshifting, that were impossible to replicate with a handheld controller – but now I have much more than a controller in my hands. I want to practice elements of my driving behavior in games. And I can. This wheel is immensely satisfying to use. I’d like to conclude the article with a summary of my experiences, positive and negative, with the Fanatec GT2 wheel, ClubSport pedals, shifter set and racing stand. As you can see, this product offers a lot of value and is exceptionally fun to use. However, there are some things you should know before you decide to purchase this wheel. Fanatec’s products perform better than any other race wheels I’ve owned and used, namely, the Microsoft 360 Racing Wheel and Thrustmaster Ferrari wheel. However, Fanatec’s quality comes at a steeper price than those wheels. The setup I’m using – the Fanatec Porsche 911 GT2 Wheel - US, Clubsport Pedals, RennSport Wheel Stand and Shifter set are $249.95, $199.95, $129.95 and $29.95 respectively. $609 is a lot of coin for a video game peripheral, even one that works across three platforms. 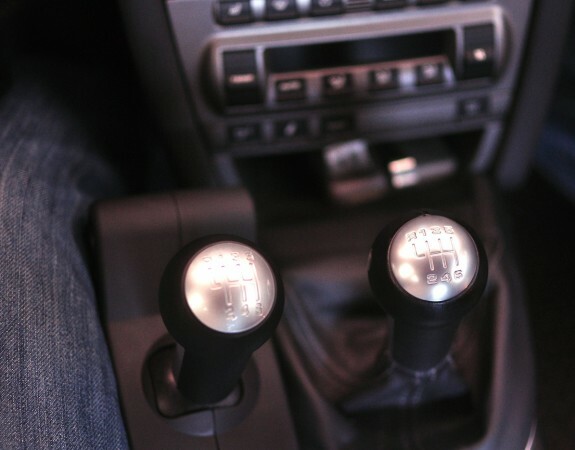 The one driving element I was most excited to have in my living room was the Helix six-speed shifter set. I am so tired of being limited to pressing buttons or flapping paddles when I played games, I was really excited for the shifter accessory. Unfortunately, it seemed to be the weakest element in my setup. The shifter itself is secured to the wheel by driving two metal poles through both the wheel and shifter components. Aesthetically, it is pleasing, but the shifter does not feel stable, period. This is because the two poles have a degree of flexibility, so each time I shift, the poles flex and pitch the entire shifter component back and forth, even when the shifter is tightly secured. This makes the setup feel cheap, which is incredibly frustrating [We felt the same way when we reviewed the original Fanatec Wheel and suggested a DIY fix toward the end of the review]. A variation on that theme, I had a similar problem with the wheel stand. The base of the stand is very solid, thick aluminum and steel construction. The wheel support can be tilted and locked at two different angles, 90° and 120°. I preferred keeping it locked at 90° but even with the locking bolt threaded tightly into the stand’s base, it rocked back and forth ever so slightly at the base. Of course, this motion translated to a good 4-6 inches of movement at the top of the wheel stand, where the steering wheel and shifter were secured. It was frustrating for me when I used the wheel because I felt compelled to pull and push the unit back into position with the wheel – which detracts from the atmosphere and the otherwise realistic nature of the product. The 120° slot does not suffer from this problem, but with the seating I have at my house, I could not find a comfortable position for the wheel and pedals with the stand tilted at that angle. The GT2 wheel has a built-in wireless device to communicate with an XBOX 360, it lacks a similar device for PS3s. According to the Fanatec website, GT2 wheels are compatible with an RF Dongle shaped like a Porsche key for wireless PS3 connectivity. The dongle is available seperately for $29.95. I’m able to make do without the wireless connection because my couch is literally within four feet of our entertainment center, so I was able to plug the wheel directly into the PS3 without difficulty. People concerned with the wire clutter I mentioned earlier may see this as an exceptional value. The biggest concern with my wheel was its built in LCD display. This display allows users to navigate through a succinct tuning menu to optimize the wheel from game to game. My screen failed within 20 hours of game time. This is a picture of the wheel sensitivity adjustment menu. At least, I think it’s the wheel sensitivity adjustment menu. If I’m correct, then the number should read 880, but with so many burnt out bars, I can’t honestly say. The missing sections made it very difficult to confidently navigate the tuning menu. For the amount of money needed to purchase just the wheel, I really expected it to last much longer than that. I contacted Technical Support for the wheel and was met with friendly people earnestly wanting to help right this wrong. Initially, I was provided with a set of instructions explaining how to disassemble part of the wheel to diagnose my faulty screen. I explained I wasn’t comfortable taking apart the wheel and did not want to risk damaging the wheel further. I was linked to an RMA form and Fanatec sent a replacement wheel without further questions. I can only assume my wheel is the outlier in their production patterns, not the norm. After all, Porsche does not grant product licenses to just anyone. This is a great time to change gears and discuss the things I truly enjoyed about Fanatec’s products. First, I want to point out that my screen failure revealed something American buyers should consider. Fanatec is based in Germany. The wheels are built and sold in Germany. Their products aren’t like the cars we so enjoy; when your Porsche has a mechanical problem, you can take it to a nearby Porsche mechanic. As I understand things, if a Fanatec wheel breaks or malfunctions, you don’t get that luxury. The options are these: ship the wheel back to Fanatec for inspection or diagnose the wheel yourself, with guidance from Fanatec Technical Support. I don’t want to pay for oversea shipping to get a wheel diagnosed, but I respect the company’s position and really appreciated the fact that they respected mine. I may not have been happy when I contacted Fanatec’s customer service, but they made sure I was happy when I left. There may have been a small language barrier between us, but everyone I communicated with from Technical Support seemed to speak English well enough, so long as I didn’t ask confusing questions within long-winded run-on sentences like this one I’m typing now. Thanks again, to everyone at Fanatec who helped me with my hardware issue. The Clubsport Pedals were by far my favorite part of this setup! All-metal construction, noticeable differences between the resistance springs on each pedal, the ABS simulator on the brake pedal – all these features and then some contributed to a peripheral that felt both durable and realistic. Heck, these pedals are of a higher quality than the ones in the cars I drive on the road! I don’t want to jump into a tangent, but I have to say that there is an exceptional value when sim racing allows drivers to perform shifts, heel-toe downshifts, rev matches, and other more advanced driving techniques. The ClubSport pedals went above and beyond the expectations the wheel itself exceeded. Like a lot of these Fanatec products, the ClubSport pedals are very expensive; almost as expensive as the race wheel itself. I found they were worth every penny. The wheel was also a great value. While not all-metal construction like the pedals, its overall look and feel are decidedly Porsche. With my race wheel experiences, I think the important thing to remember is you really get what you pay for. Three years ago, I purchased a new Microsoft race wheel and pedal set for 50 dollars from Amazon (They cost over $100 when they were initially released). Compared to the Fanatec wheel, the Microsoft offering is a plastic-coated heap of junk. Even on its own, the Microsoft wheel was unsatisfying to use. It looked, felt and behaved like it belonged in a dilapidated arcade hall. Out of the box, the wheel was tilted 30° off-center. No amount of recalibrating or re-centering was able to permanently fix it, either. The Fanatec wheel didn’t suffer from those problems. 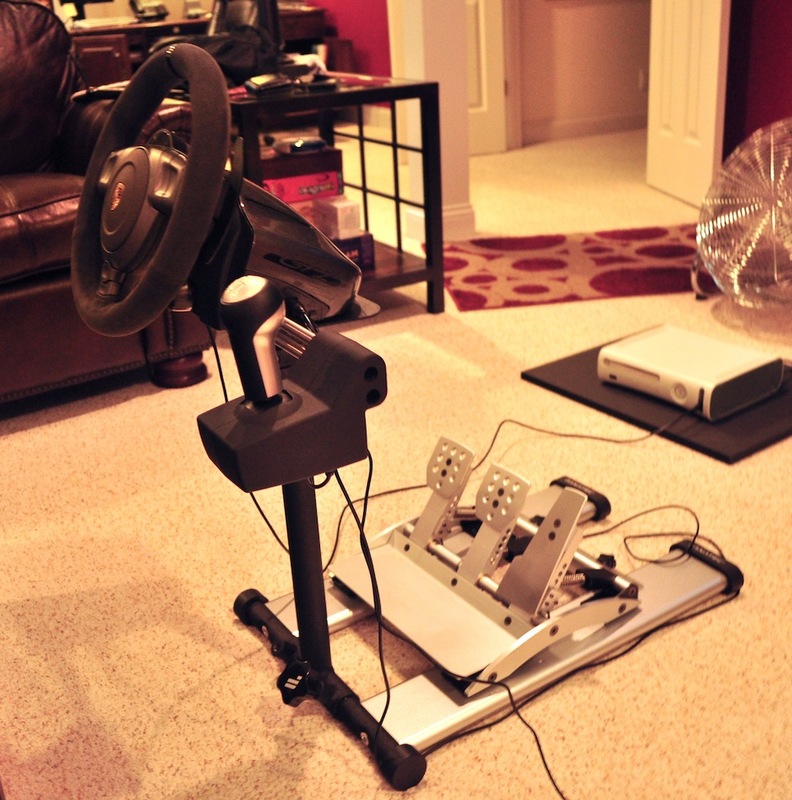 Are the Fanatec wheel and its peripherals perfect? No. There is room for improvement, especially with the shifter assembly and the wheel stand. Combined, these two elements cost $150.00. Others may feel differently but I believe if I’m spending that much money on “nonessential” accessories for a premium simulation racing wheel, they should at least meet their functional expectations. Cumulatively, though, this product has been a joy to use, and the premium price of Fanatec’s wheel is matched with premium performance as well. I may have initially received a flawed wheel, but in the end Fanatec renewed my confidence in them and their products because after they were made aware of my situation, they acknowledged the issue and promptly took action. I can gladly and earnestly recommend this product to drivers looking for a great sim wheel. It looks, feels and performs better than other home-use wheels I’ve owned and used, as well as race wheels from some high-end driving simulators at a local arcade. I could write more about the wheel, but I just remembered there was something I needed to do today…. Happy motoring, virtual and otherwise! Today's post was written by frequent contributor Andrew Granieri. Andrew is a Techncial Writer who lives with his lovely wife in Ohio. His Porsche 944 pulls double-duty as a summer track car as well as a venerable winter weather vehicle. Coincidentally, those are his two favorite driving conditions. Editor's Note: Fanatec is not a sponsor of FlatSixes.com and the wheel was purchased in order to review it. If you are interested in purchasing a Fanatec wheel we encourage you to do so through one of the links here in this post. By purchasing through one of these links, FlatSixes.com receives a modest affiliate commission that helps to defer some of our operating costs. Purchasing product via links on FlatSixes.com is one of the easiest ways to support our free site and newsletter. To learn more about how we support the site, please read our formal disclosure. iRacing. It's So Good, It Stinks! @Chuck, when I race online, I can’t drink, period. Just like driving a real car, alcohol severely compromises reaction times and, subsequently, racing perfromance. I used to race with a beer but the mocking from prepubescent competitors post-race got a little old. That bottle of Jimthe Beam Rye is there for other games! “When you’re racing, it’s life. Everything that happens before and after is just waiting.” What do you do when you’re waiting, David? And what makes it so much better than an occasional racing simulation? Inquiring minds want to know. One could argue that Porsches themselves are little more than these “big boy toys” as you put it… do you have a Porsche, David? Is it excluded from your list of “big boy toys”? Andrew, I should have complimented you earlier on an excellent product review that seems unbiased and fair. Also it’s a useful review as there is a large market for for those types of games/hardware, larger than I ever thought existed. @Chuck, my thanks. There are enough biased product reviews out there, I figured I would try something different. Keep in mind, Fanatec sells cockpits too, and those are even more expensive than the products I reviewed. I may take a stab at welding my own cockpit after I source some metal and an old 911 sport seat. @Pepper Girl my thanks as well. Bottom line, with the good and bad, you get a peripheral that’s fun to practice certain elements of real life racing. I am curious how the Logitech products compare – if I could borrow someone’s G27 wheel it would make for an interesting followup piece. I anticipate usage of this wheel increasing dramatically during winter months, when I can’t hit the track. For anyone interested, here is a link to a PDF of GameInformer magazine’s interview with Patrick Long. The link itself comes through http://www.patricklong.com. It would seem sim racing isn’t just for kids these days! 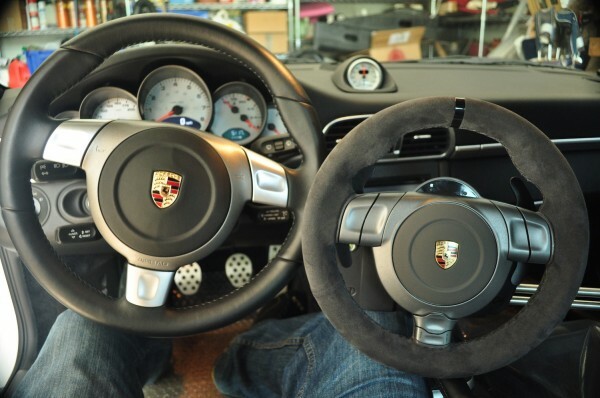 Okay which is it… the GT2 wheel or the GT3 wheel? Your heading titles conflict with each other. One says “Fanatec’s Porsche GT2 Race Wheel Reviewed” and the other says “Andrew’s Review of the Fanatec GT3 Race Wheel”. From looking at the pictures in your article below and comparing them to the web site it appears that it is the GT2 wheel and not the GT3 wheel. They should offer Porsche owners some type of discount on the setup. It is the GT2 wheel. Sorry for the confusion. I don’t know that Porsche owners benefit from a discount, but due to the fact that these are manufactured in batches, some products are not immediately offered. I remember reading on the site that PCA members enjoy priority shipping over nonmembers. Boa tarde, onde eu compro este kit ? E quanto custa o kit + as taxas de envio para o Rio de Janeiro no Brasil?